The Division of Cardiology cares for children with heart or blood vessel problems that may not require surgery. 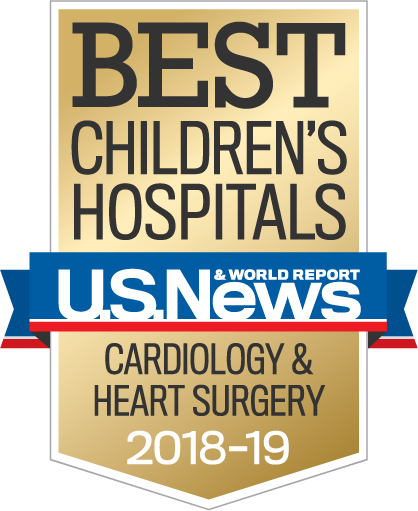 Children’s Hospital Los Angeles is ranked among the top hospitals in the nation for pediatric heart care on the U.S. News & World Report Best Children's Hospitals List. We are a recognized leader in state-of-the-art evaluation, diagnosis and treatment for all forms of heart disease. As a core component of the hospital's Heart Institute, our division offers expertise in all major areas of cardiology, with nationally-recognized subspecialists. Children are referred to us for care from across the western United States and Pacific Rim countries. Our Heart Institute is also designated at a Children's Cardiomyopathy Foundation Accredited Center of Care recognized as a medical center in North America that provides high-quality cardiac care and specialized disease management to children with cardiomyopathy. Fellowship training in cardiology and our participation in multicenter studies also are integral aspects of our division's emphasis on advancing the evaluation and treatment of heart disease in kids. The Cardiac Electrophysiology Program provides comprehensive care for children with heart rhythm disorders, including slow heart rate, fast heart rate and other irregularities. While these disorders often occur in otherwise healthy children without other heart conditions, children with congenital heart disease are at higher risk. Read more. When the unborn baby has a problem with the heart, families need the services of doctors who specialize in caring for both unborn babies and newborns and children with heart problems. The Fetal Cardiology Program provides all of this and more, with a seamless collaboration with the Heart Institute and the Institute for Maternal-Fetal Health. Read more. The Heart Institute at Children's Hospital Los Angeles provides multidisciplinary care to children with severe heart failure of all causes. Our team uses cutting-edge medical and surgical treatments that are customized to the needs of every patient. A modern mixture of medical treatments are used, complimented by advanced pacemaker technologies, mechanical support, advanced valve surgery and heart transplantation when needed. Read more. The complete spectrum of invasive cardiovascular procedures are performed in the cardiac catheterization laboratories at our hospital. These procedures include both diagnostic and interventional procedures. These procedures are performed in a state-of-the-art imaging facility designed to optimize imaging and minimize radiation exposure to the patient in an operating room quality facility. Imaging and hemodynamic measurements are made to optimize decisions regarding catheter or surgical treatments. Non-invasive imaging provides the basis for cardiac diagnosis in most young patients with heart disease. Advances at our hospital in two- and three-dimensional echocardiographic imaging of the heart allow precise evaluation of structural (congenital) abnormalities of the heart and the provide the basis for most decision-making regarding whether treatment is required and the best possible approach. There is a major commitment to continued advancement in non-invasive cardiovascular imaging at our hospital, and it is a primary focus of training and research. Our non-invasive cardiologists are directly involved in clinical research and the training of echocardiography sonographers, pediatric and adult cardiology fellows, and cardiologists both from the United States as well as around the world. The noninvasive section hosts a variety of educational programs, including an annual echocardiography symposium. Closely related to echocardiography, is the field of cardiac magnetic resonance imaging (MRI). Working in collaboration with the Department of Imaging Services, the Division of Cardiology has been a leader in the development of this technique for the evaluation of both congenital and acquired forms of heart disease. Affecting young children, mostly under the age of five, Kawasaki Disease, also known as Kawasaki Syndrome, has surpassed rheumatic fever as the leading cause of acquired heart lesions in children. Heart Institute cardiologists are nationally recognized leaders for their clinical research into and management of Kawasaki Syndrome, a serious rash illness that can cause coronary artery aneurysms. The program provides for the diagnosis and management of children and adolescents with abnormal lipids including familial hypercholesterolemia and metabolic syndrome. Nutritional consultation and counseling are integrated into each patient's management plan. The program includes treatment and lifestyle counseling for patients and their families. The young adult cardiac program is a joint clinical program involving both the hospital and the Division of Cardiology at USC-University campus. This program provides care for patients who require cardiac treatment beyond their teen years. Teen patients are treated separately from infants and children to promote their accepting of their own growing responsibility for managing their illness. Cardiovascular diseases are the leading cause of death in the United States. Over the past two decades, significant advances have been made in understanding the molecular pathology of inherited cardiac conditions. There are currently approximately 200 genes known to be associated with cardiac disease.